Wisp Replacement Parts BUY Wisp Nasal Mask Parts, Wisp CPAP Mask Parts, Wisp CPAP Parts, Respironics Wisp Parts & Accessories, 1094086, 1094087, 1094088, 1094080, 1094081, 1094082, 1094078, 1094083, Wisp Nasal Mask Accessories. Wisp Headgear, LARGE - SHIPS FREE! Clear Frame - SHIPS FREE! Fabric Frame - SHIPS FREE! Wisp Headgear, STANDARD - SHIPS FREE! Petite Cushion - SHIPS FREE! Small/Medium Cushion - SHIPS FREE! Large Cushion - SHIPS FREE! Wisp CPAP Mask Parts from Respironics are available to keep your mask working well and to keep you breathing well. Wisp Mask Replacement Parts from Respironics include the Wisp Mask Cushions, Wisp Mask Frame, Wisk Mask Headgear and Wisp Headgear Clips. Wisp Mask Replacement Part Numbers include 1094086, 1094087, 1094088, 1094080, 1094081, 1094082, 1094078, and 1094083. 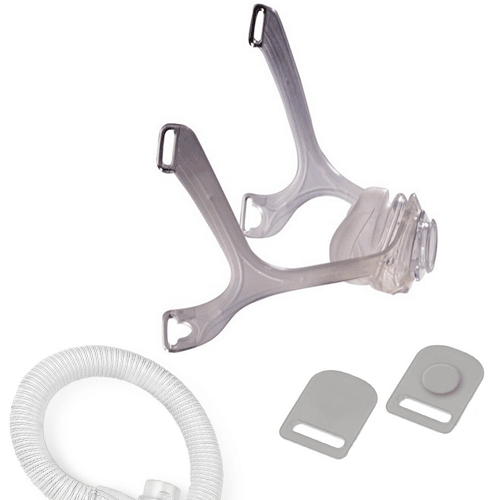 Respironics Wisp Mask Parts and Accessories at Vitality Medicalfor sale at discount prices! Great experience will be using your company again. Finally a place where I can get parts to continue to use my mask without having to buy a replacement mask.